Dan Kaufman and I have done it again. We have produced another fun (well, to us!) 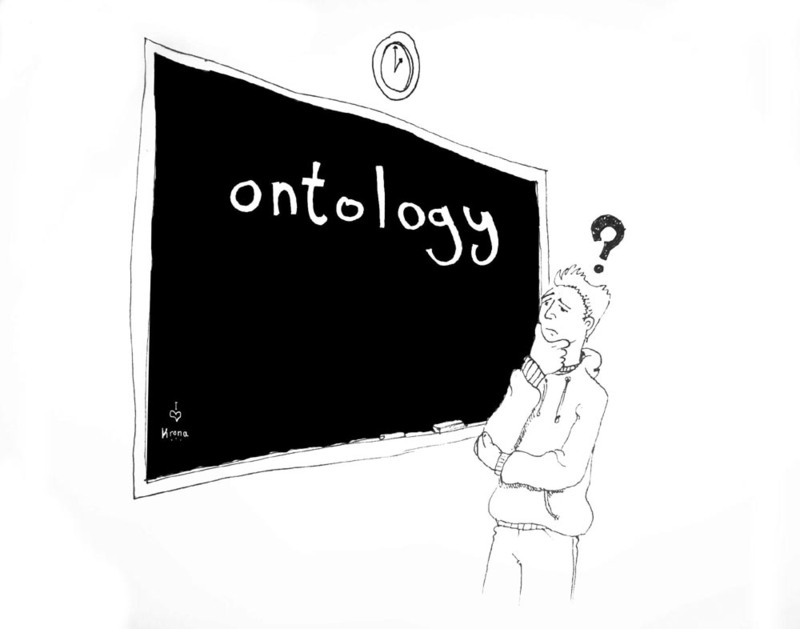 video conversation, this time on the pretty tough philosophical issues surrounding that branch of metaphysics known as ontology, i.e., the study of what is. But “know” here is yet another tricky word, as there are different theories of knowledge, and I suggest, in response to one of Dan’s excellent questions, that we deploy — sometimes without thinking — different conceptions of truth in different contexts. For instance, when we say that it is true that the Pythagorean theorem holds (yeah, yeah, in Euclidean geometry) we are not saying the same kind of thing as when we say that it is true that Saturn has rings. In the first case we deploy a coherence account of truth, in the second a correspondence account. We then talk about materialism, and I admit to Dan that while I am a naturalist, I am not really a materialist, at least under certain conceptions of the term. I believe, for instance, that the Stoics virtues exist, but they are not made of matter, they are human concepts, necessary categories we use to talk to each other, tell each other what to do or not to do, and so forth. The same goes for a lot of other things, especially things that have to do with values. Mind you, I’m not about to deny that every physical object is made of the same stuff (be it quarks, strings, or whatever physicists decide in the end). But I don’t think that an ontology based only on fundamental physics is sufficient to make sense of the world. Which, of course, brought Dan and I to discuss Wilfrid Sellars, the philosopher who introduced the famous distinction between the manifest and the scientific images of the world, and who was the subject of a separate dialogue published previously. Near the end of the video we even get to re-examine Daniel Dennett’s famous contention that certain things (like consciousness, or the self) are “illusions.” We find that we may agree with Dennett only if we use the word “illusion” in a very specific metaphorical sense, and we are not positive that Dan (Dennett) would agree to be so constrained. This entry was posted in Sophia Videos on July 17, 2018 by Massimo. As for our terms, I still think there’s a distinction between how “non-local” is used versus “non-localized”. I was thinking of something that was extended, or not-localized to a particular place. As far as I understood, non-local is used with a specific meaning, where a change in one place would simultaneously cause an effect in another place. This has particular implications on causality, as the “cause” and “effect” can be effectively swapped if you choose appropriate frames of reference (https://physics.stackexchange.com/questions/116814/principle-of-locality). One of the places I’m confused I guess, is what scientism and naturalism are, as opposed to materialism. I also didn’t finish my thoughts on Science and Mathematics: I was saying that they choose strategies to “not be wrong.” That doesn’t mean they’re going to be wholly right either. I find myself at an epistemological and ontological crossroads: I can’t buy into religion, and while I have faith that science and mathematics can lead to truth, I also can’t rule out that they’re missing something. Hence why I’ve started dipping my toes into philosophy, listening and reading and writing uninformed comments on other peoples blogs! DK my reply seemed of a kind/tone to your own dismissal of my point which remains, legislators levy taxes tax collectors collect them and if you sue the “state” there are other specified people who are responsible for reacting to that nothing more or less, just people enacting their roles in whatever way they do, what is gained by adding some ghostly behind the scenes actor like the State to the equation, what can’t I account for in my analysis? You might be interested in Ladyman and Ross’ Every Thing Must Go. They suggest that there are only patters, and different levels of description. I’m not sure I buy it, but it’s an interesting perspective. no need to apologize for my frustration. I’m the one who chooses to write a blog and read and answer comments… It’s on me. I don’t think it should be verboten. I just find it both overused and misleading. Notice that Hume never used it. Perhaps this is one intuition pump that Dennett shoudl set aside? No, there are qualia, if by qualia one means — as I do — the ability to have first-person qualitative/sensorial experiences. Which you and I have, and our iPhones don’t (pace Coel’s old argument). That is the thing to be explained. Which is why referring to it as an illusion is unhelpful, in my mind. Who cares? Why does it matter? Let’s agree to confine Holmes only to the Conan Doyle canon. That’s very, very precise. It’s a finite number of words, we can read them all, then have empirically-based discussions of what is true, untrue, and unknown about Holmes. I’m fine with that, nothing big hinges on the choice between those two words. What’s hard is how to make sense of the fact that we can make true statements about an imaginary person. And I suggest we can for reasons similar to why certain mathematical theorems can be said to be true. Coherence, not correspondence. Reductionism is a kind of ontology. It makes no sense because it isn’t true. Plenty of mathematical statements, indeed the overwhelming majority of them, have absolutely no mapping on anything in the real world. We can make make true statements about fictional characters. For example the statement “Arthur Conan Doyle depicts his character ‘Sherlock Holmes’ as believing that the Sun orbits the Earth’. That is a true statement. But the statement “Sherlock Holmes believed that the Sun orbited the Earth” is not a true statement because there was never such a person holding such a belief. Informally we can accept the second statement just as long as we understand that it is shorthand for the first. Similarly the statement “Sherlock Holmes is a detective” could only be considered a true statement as long as it is understood to be shorthand for something like “The fictional character Sherlock Holmes is depicted as being a detective”. There was never any actual detection done by any Sherlock Holmes. All of these are true statements in the sense that “Sherlock Holmes is a detective.” is a true statement, but I expect that most people here would not want to give a simple ‘yes’ answer but rather to make clear what they meant by it. For Materialists, Physicalists etc, I think I would prefer to hear them in their own words. If someone really did say, for example, that virtues are made of matter, I think I would like to read the thing in their words in context. Precious few people appear to identify as Materialists or Physicalists, they are usually descriptions of other people’s positions. But an Eliminative Materialist, for example would more likely say that the concept of virtue belongs to folk psychology and as such will be eliminated in favour of completed neuroscience. I find the idea implausible myself, but that is close to the kind of thing Eliminative Materialists actually say. Another kind of Materialist might say that any true statement can be restated as a statement or series of statements about the behaviour of matter as described by physics without any loss of meaning. Well that may be true about statements about something like a state. But the statement “Stubbing your toe really hurts” would definitely lose meaning if restated as a statement or series of statements about the behaviour of matter as described by physics. But then again, I am also just guessing at what a Materialist or Physicalist would say, maybe I am also being unfair to them. You’ll be happy to hear that I have paid attention, and I hope even more so that I actually do not demand that philosophers come to absolute agreement. If that were to happen then we’d lose philosophy as a cultural institution, or humanistic “art” in which people are able to appreciate the same perplexing questions from the days of Socrates to today and beyond. But I do think we need something (which doesn’t need to be called “philosophy”, if that helps) which does reach various agreements regarding metaphysics, epistemology, and axiology. For the topic at hand however, I propose “language” as the overlooked concept from which to reduce the problematic terms discussed here, back to a physical world. After all, I presume that physical things create all elements of language. Right? Robin: the question of fictional descriptions and truth is difficult and there is a substantial literature devoted to it. There is no way to arrive at a sound view just by thinking it through for a few minutes. I also don’t think it has any bearing on the question of physicalism and whether social reality poses an intractable problem fornit, which is what the dialogue is about. Mathematics bears on it a bit more but there’s a reason I didn’t use numbers as my main argument point, since they are problematic in ways that I don’t think social things are. That is just plain incorrect and contradicts somethings you said (the one I agreed with). ‘If this then that’ is math. Now it’s possible ‘that’ is ‘true’ even if ‘this’ is not. Math does not deal in ‘absolute’ truth and science deals only in the tentative. ‘It’s just a theory’ though some theories are damned good. I do not know if there’s a proof that Pythagorean theorem is only valid for Euclidean geometries. It seems possible there is, but I don’t know. Vesper: I don’t get your point. Holmes is imaginary. It’s more fun not to dwell on that as you read a story. It’s still just a story. Almost everybody understands that; it’s not a subtle philosophical issue. I don’t see the problem. It seems perfectly easy to do. Theorem’s are true because the premises logical lead to the theorem. Sherlock Holmes lives at 221B Baker St. because Conan Doyle wrote that he did. There’s nothing logically compelling about that ‘truth’. Doyle could have made up any address he liked or had Holmes be a homeless vagrant who solved crimes. The ‘truth’ about Holmes is what Doyle made up (imagined). So I would say the ‘truth’ about Holmes corresponds to what Doyle said about him. And if a pastiche it corresponds to what those authors say. The ‘truth’ is about the story more than the characters or the characters in the context of the story. I can certainly understand how reductionism would seem to be the logical way to arrive at an ontology, given an essentialist assumption. Yet that seems to be why the debate goes in circles, as we try to distill out some clear basis, that turns out not to be so clear when examined. So I’m arguing the opposite, that an ontology has to accept everything as it is, no more and no less. Am I good with “element of language” being an adequate description of Missouri? Well, I live in Denmark. That’s bloody far from Missouri. I’ve never been there. As far as I know, a name on the map might be all it is. But that’s a measure of my ignorance, and not of Missouri. No, I’m not okay with ‘element of language’ as an even remotely adequate definition of Missouri. If you really badly want one, I’d say it is a political-geographical entity that holds jurisdiction in its territory, and capable of entering into lawful agreement with other entities, be they other states, foreign countries, businesses or individual people, and itself subject to federal law; and that acting as such it has material consequences for its citizens; where material refers to the living conditions of human beings, and not to whatever the theory of matter says about its subject. That would be about adequate. Since it has material consequences as that entity, it would be absurd to insist that it somehow doesn’t exist as that entity. It is true that if the subject is the nature of spacetime, say, then the existence or otherwise, of Missouri, may be safely disregarded, at least by those of us who do not live there. But conversely, if the subject is Missouri, whatever the General Theory of relativity has to say, is simply irrelevant. And these are not matters of existence, but of framing and relevance. I don’t quite understand how so many people have such a hard time accepting an account like this, which I would regard as pragmatic. In any case, the category of existence is itself socially constructed, and what it means for something to exist, can only be what it means to us. And as for that, the only meaning I can think of it as having, has to do with the conditions of our existence. I don’t see a problem either. Holmes, numbers, the rings of Saturn are just examples to be able to cash out different meanings of the word “truth” and why it’s good not to confuse them. Counting things like rings of Saturn is hard since they are fuzzy. But the problem is largely linguistic — what do we mean by a separate rings? QM is even worse — a laser is not in a state of fixed photon number state, but a superposition of many different number states. Are all those different states real? The state of the Laser is close to a classical wave…but the atoms that contribute to it are emitting one photon at a time. Note: In this case the number states are distinguishable conceptional, but if you try to measure which one your in the laser stops working. The same kind of issue arises in the case of the ‘reality’ of virtual particles. Hi Massimo, Dan and everyone. Very stimulating video and thoughts! A physicalist emergentist view in which numbers, concepts, social reality, fictional stuff, etc. are viewed as emergent (probably in the epistemic fashion) of our individual and collective consciousness (which in turn emerge from our brains) seems reasonable to you guys? The talk of illusions seems to me to be derived from reductionism, but not necessarelly from physicalism itself. a lot would depend on how one cashes out the idea of “emergent.” Just like with the idea of “patterns” proposed earlier in this thread. Take 11-world. 11-world consists of the multiplicative ring of the numbers 1 through 11. In 11-world there is a largest prime: 11. So it is not absolutely the case that there is no largest prime. It’s the case in N. But this does not depend on any ontology for N. It’s the case regardless of whether N exists for some particular notion of existence. As an intuitionist I have no problem with the concept of number being a social construction. And it is part of that construction that numbers must be good for counting with. So imagine, if you will, customers at the local math shop. And let us present them with a system that has the property that the successor of a number is a number. I think they would buy that. I know I would. There are certainly very many ways in which to construct a number system. And sets like R for which there is no meaningful successor relation. But if there is a successor relation, then it must be the case that the successor of a number is a number, because that is what captures the common sense notion of what numbers are. In other words, that is what it means for something to be a number. I get that you might prefer a more formalist approach, but when I said that I get where you’re coming from, what I meant was that I agree with you that the truth of the Pythagorean theorem neither depends on there being something for it to be true about, nor on the particulars of the formalism in which it is expressed. Like I said elsewhere, yes we could invent manners of speaking wherein these things could be said to exist, or to exist as. But I don’t think that’s either necessary or useful, and I would rather we did not. Either way, I’ve enjoyed this exchange of views, but now I’m going to call it a day. Sherlock Holmes does not exist, and that is not the point. The point is that there may nevertheless be matters of truth pertaining to things that don’t exist, and Sherlock Holmes being a detective is an instance of that. I didn’t say Sherlock existed or anything remotely like that. I said that ‘truths’ about Holmes are ‘truths’ about the stories. This is a ‘correspondence theory of truth’ but it’s correspondence to a story rather than ‘reality’. ‘Unicorns have only one horn!’ is a statement about a myth, not a creature. I have been through this all before. All you have done is change the meaning of ‘prime number’. The multiplication operator has a different meaning applied to a set of only eleven. In other words you have swapped another operator for the multipication operator. We can do that with any statement at all, as I pointed out earier. The statement “Saturn has rings” is false for some other definition of ‘ring’. It is true that a whale is an insect for some definition of insect. It is true that I am the President of the Unitied States for some definition of ‘President’. Since there is no statement that can’t be made false by changing the meaning of one or the words in it then, by your logic, there is nothing that can be said to be true except as a social construct. Which means that all of your statements are only true in this sense. For any statement you now make I can change the meaning of some of the words and make it mean ‘yes, you are completely right Robin’. No. By the standard definition of ‘prime number’ there is no highest prime number and there can be no possible way reality can be in which there is a highest prime number. And no, it is not true that Sherlock Holmes is a detective, unless you mean that the character Sherlock Holmes in Arthur Conan Doyle’s stories and most derived stories is depicted as a detective. Otherwise “Sherlock Holmes is a detective” is no more a true statement than “Sherlock Holmes is an actor pretending to be a detective” or “Sherlock Holmes is a tax accountant”. Indeed, which is why I didn’t just think about it for a few minutes. I have probably been thinking about this for longer than you and I have tried some of the literature but the examples I have seen seem to be unnecessarily obscure. I can’t see anything wrong with the notion that when we encounter a statement like “Sherlock Holmes is a detective” and ask if it is true or not, we try to clarify exactly what it is that is true. After all, in my story Sherlock Holmes is a tax accountant. In other stories he is an actor fronting as a detective for Dr Watson. if by qualia one means — as I do — the ability to have first-person qualitative/sensorial experiences. I think there’s some ambiguity there. You think a (perfectly) simulated person in a simulated computer environment wouldn’t have first person experiences. I think it would. I think all we need to explain are the functional aspects of experience — how it responds to its environment, appears to believe itself to have first person experiences and so on. I think that’s all there is to first-person qualitative/sensorial experiences — I think they are purely functional at bottom. But that’s not denying that first-person qualitative/sensorial experiences exist, it’s a disagreement as to their nature. On the other hand, you think there’s more to it than the functional side. You think that we need an explanation for the ineffable redness of red and I don’t, because I don’t think there is an ineffable redness of red, I just think there is the functional ability to recognise that one is perceiving red light, and that this is all the qualitative experience of red is (at least in the context of a mind functionally organised somewhat like that of a normal human, and perhaps not in the context of an iPhone). The word for what you believe in but that I don’t is “qualia”. As such, qualia eliminativists shouldn’t in my view be interpreted to be saying that nobody has first person qualitative experiences. Indeed. As I think any platonist would. The purely abstract rules-based game of chess is a platonic object like any other mathematical game (Conway’s Game of Life for instance). I don’t see anything particularly preposterous in this — the platonic existence of chess is no more nor less preposterous than that of set theory. That’s not to say that all aspects of chess fit in here — chess also has a history for instance, and I would treat that separately. I think you feel it is preposterous because chess doesn’t seem to correspond to anything much in physical reality, and you feel that platonism is chiefly motivated by the “the unreasonable effectiveness of mathematics in the natural sciences”. But for me platonism is more about the fact that there are objective truths about mathematical objects which are there to be discovered. The Mandelbrot set doesn’t seem to correspond to anything in reality either, and yet I don’t see why it is particularly preposterous to hold that up as a paragon example of a platonic object. Is it just that chess is a trivial “game” that makes its existence preposterous, as opposed to an object of serious mathematical study? If so, that seems a little superficial to me. On my point about the imprecision of Holmes, this issue matters because it shows a difference between the objects of literature and myth and social reality and the objects of mathematics. That difference is enough from my perspective to make Holmes disanalogous to a mathematical object, because mathematical objects are objective and mind-independent in at least one way that Holmes is not. It’s pretty precise, but it’s nowhere near mathematically precise. If you treat the Conan Doyle canon only as a sequence of characters then it’s mathematically precise. There are for instance objective truths about how many times he uses the letter ‘E’ or the frequency of certain words or phrases. But once you start interpreting it as a text about a prodigious Victorian detective you need to bring in all sorts of non-mathematical family resemblance concepts such as “person” etc. Again, I’m not saying it’s unintelligible or that all terms need precise definitions for successful communication — far from it. Humans can easily interpret these texts with their intuitive, flexible skill for dealing with imprecise family-resemblance concepts. Computers, on the other hand, cannot yet handle this very well. There is no computer program (yet) that can read the Conan Doyle canon and explain and interpret it as a human can, even though computers can straightforwardly be used to check and generate mathematical theorems and do other such operations which involve manipulating precisely defined objects. Indeed, I would say my job as a software developer is basically to translate the imprecise requirements expressed by my customers in vernacular language into the precise language of computer code. Sometimes it even happens that I fail to do this successfully just because of ambiguity and imprecision in the original requirements. Actually, it is [enough to show that math is coherentist to show that it has nothing to do with correspondence]. The onyl way you can bring a correspondence theory in math is if you assume Platonism. I’m not convinced of this latter sentence, but even if this is so then that is just my point — it is not enough to show that math is coherentist to show that it has nothing to do with correspondence because you would also at least need to assume that platonism is false. Which you do, and that is fine. My point is that a platonist who thinks mathematical truth is correspondence truth is not obviously or straightforwardly holding an indefensible position, and as such a correspondence truth theory of mathematics would seem to be viable (at least for a platonist) even given that the coherentist position also seems correct. But anyway, even without platonism, I still don’t see why the truth of the Goldbach conjecture would not correspond to the impossibility of finding a counter-example. You say that’s vernacular correspondence and not philosophical correspondence, but I don’t know what the difference is in this case and would appreciate a pointer in the right direction. Cool, and agreed. My point wasn’t to criticise your main argument here but just to make a suggestion that “physicalism” is a better term, and to hear your thoughts on this idea. The status of the hat is somewhat different from the status of Sherlock Holmes and the fiction about him. I would say that the hat is tradition, and as such, that it is as true as the stories. Perhaps this is a small-scale version of much larger entities whose connection to historical reality is unverifiable, although their impact on our culture is vast: e.g. religion in general, and the various religions in particular. Traditions are real, and often quite important (lives have been, and still are, sacrificed to them), but they are not necessarily true. Neither are they outright lies, e.g. statements intended to deceive or misinform. Why is it that someone can say “Saturn has rings” without having to specify that ‘Saturn’ refers to the sixth planet from the Sun using at least base 7 and the Peano axioms and that the Sun means .. and planet means … and ring means …. And yet if I say that there is no highest prime number, people feel that it is OK to substitute an obscure definition of “prime number” and claim that the new statement is no different to the statement I made? That is precisely what is meant! What are you arguing about? It would seem the ontological is another ideal that leaves us spinning in circles. Jesper said a poem has a pattern, but not “is” a pattern. A poem has many patterns. A poem is not any of the individual patterns it has. A poem is the set of all patterns it has, which is a pattern. Eric, “pattern” is the most generic term I could think of. “Abstraction” is a possibility, but I think “pattern” is better. Bringing “language” into it is entirely counter productive, I think. Statements about fictional characters generates a lot of heat. It seems simple to me. They are statements about fictional characters, i.e., statements about the fiction being discussed.